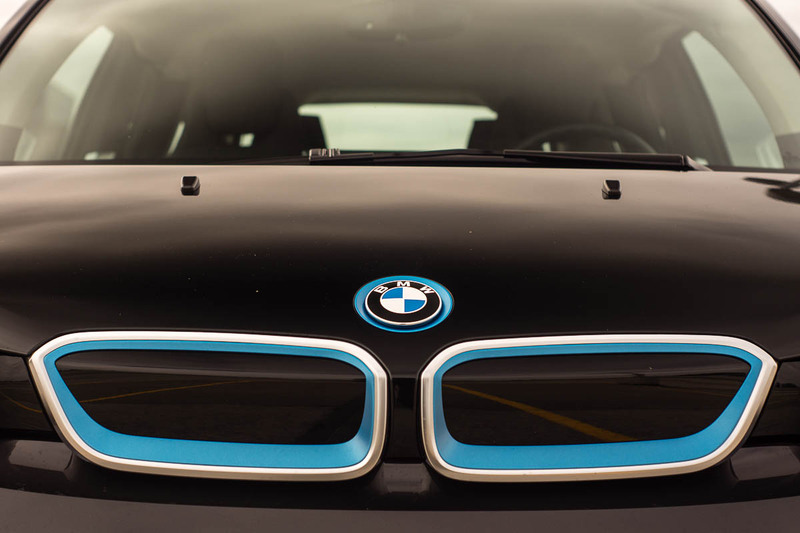 Taking a closer look, you begin to see that the i3 is made up from a lot of exotic materials. 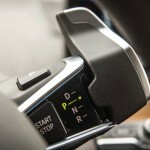 Electric propulsion in cars is high in the minds of a lot of people nowadays. 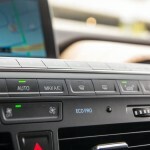 Hybrid solutions seen in cars like Toyota Prius have done a good job defining the expectations behind the worry-free solution. 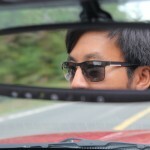 They can’t deliver the absolute best fuel economy (relative), but they require the least amount of lifestyle change. 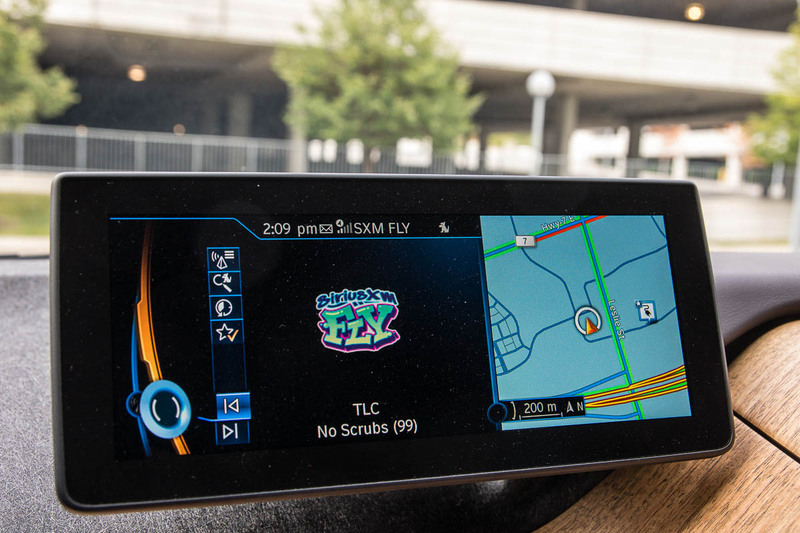 Full-on battery electric vehicles like the Tesla Model S and the Kia Soul EV are designed from the beginning to consume no gasoline, but simply operating one means range anxiety is always in your head. 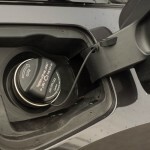 Plug-in hybrid electric vehicles occupy a happy medium, relying on electricity to get you around, but feature gasoline propulsion, just in case, to get you home. 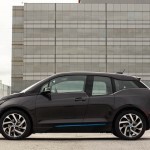 Different automakers have different approaches in how they balance the electric and gasoline powertrains, and BMW is no exception. 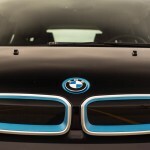 BMW has long been a brand synonymous with performance and luxury. Many would argue that they get this balance just right (at least with their smaller cars). 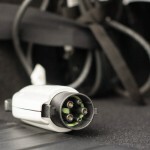 The “i” sub-brand was created in 2011 for their plug-in electric vehicles. 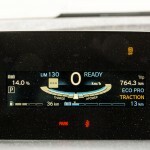 Somewhat following the numerical nomenclature, the brand consists of the i3 (tested here) and the i8. 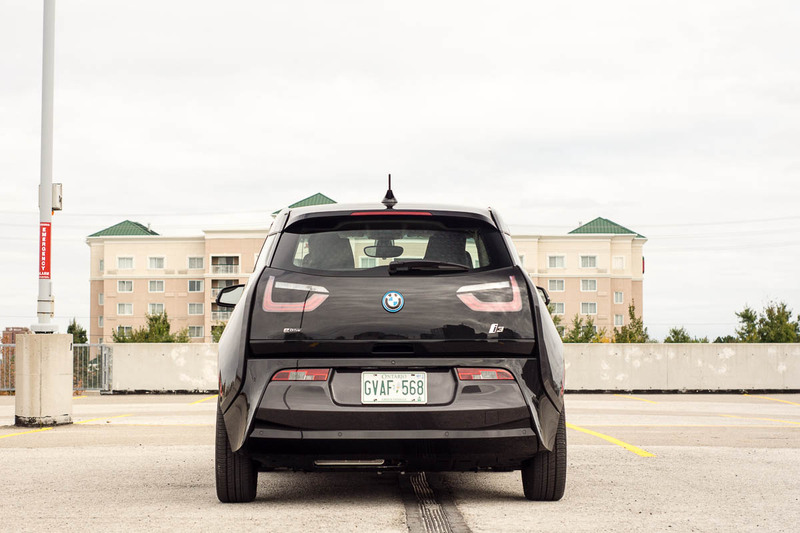 Where the i-brand differs a little bit is that the i3 isn’t just a smaller i8. 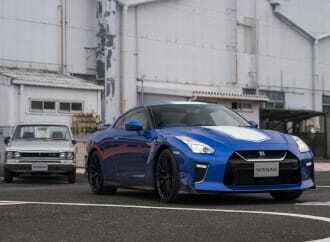 Both models are quite different from one another. They also differ in how power is delivered to the wheels. 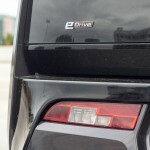 After recently reviewing the all-electric Kia Soul, I wanted to see how the i-brand would fit into my life. 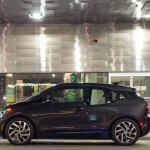 I picked up the key to a Laurel Grey Metallic 2016 BMW i3 with the optional Range Extender. The first thing that is quickly made apparent is the look of the i3. 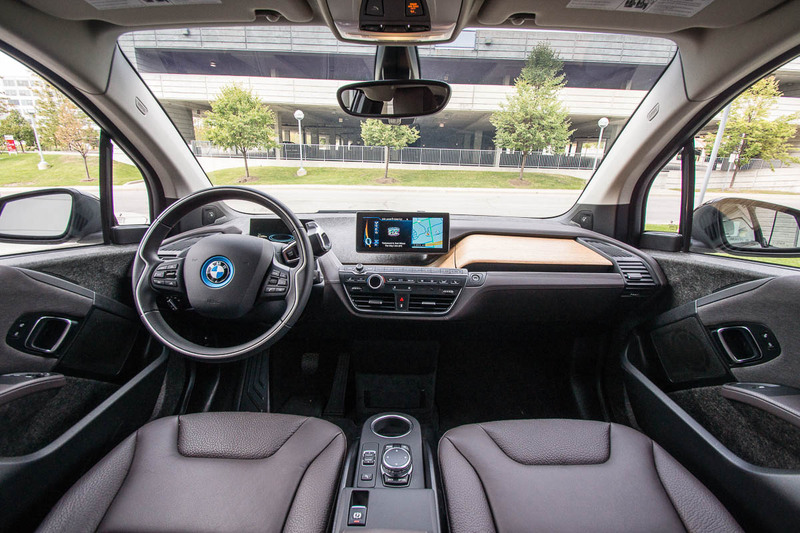 Like the i8, the i3 simply looks like it’s from the future. The majority of BMW’s more traditional road cars feature a design language they’ve never really strayed from. 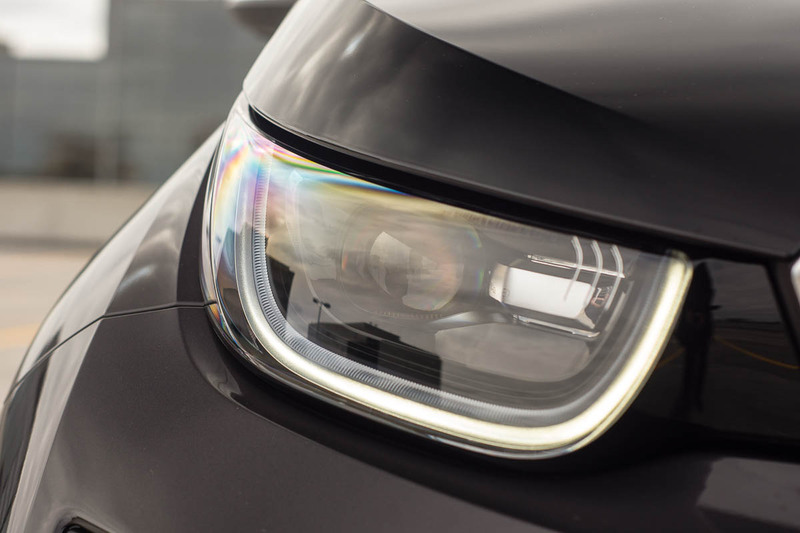 The i3 changes that up a little bit, with a lot of secondary angles that add a lot of character lines to the i3. The tall design lends itself to a surprisingly spacious interior and airy greenhouse. The rear-hinged “suicide doors” make ingress and egress very easy. 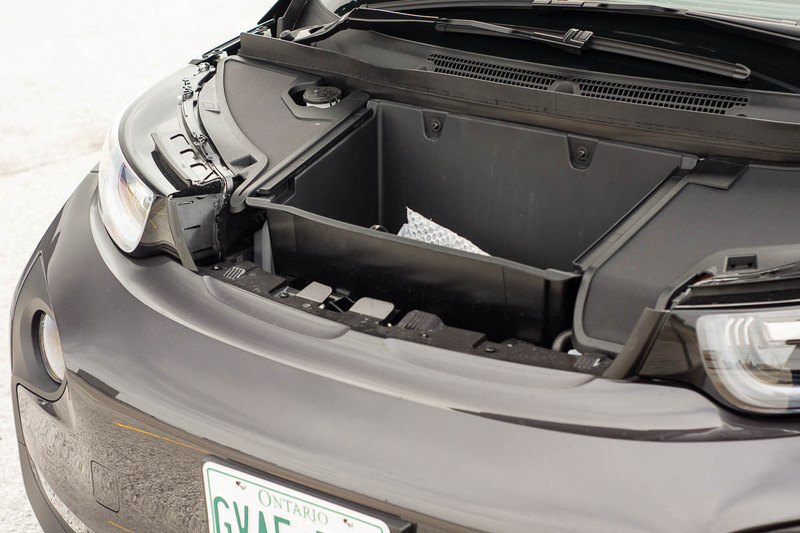 Because there isn’t a traditional powertrain up front, the hood is surprisingly short – which also means the front trunk is quite small. 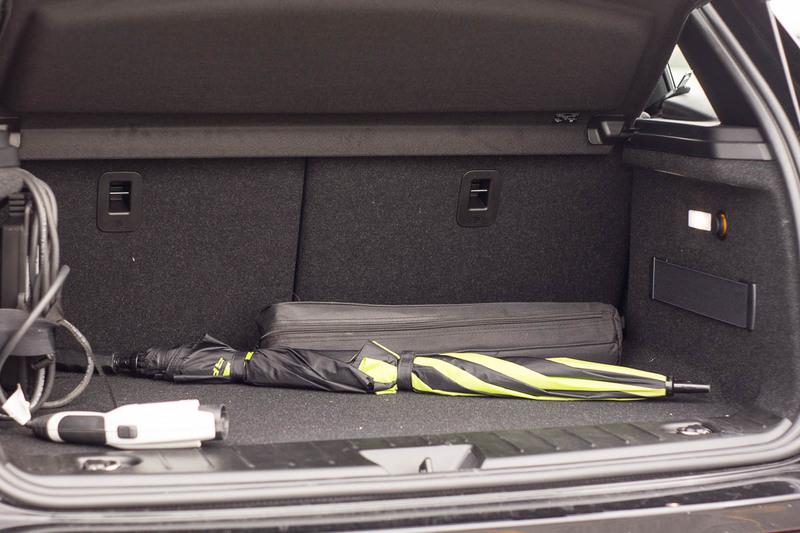 Thankfully, the rear hatch cargo section is reasonably large. Getting back to the exterior, the wheels and tires deserve special attention. Their 19-inch diameter is relatively common nowadays across the industry, but it’s the other measurements that are so interesting. 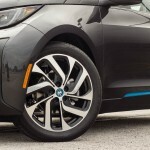 To decrease rolling resistance (which affect fuel efficiency), BMW has not only chosen an eco-friendly tire compound, but they’ve opted to make the tires hilariously narrow. 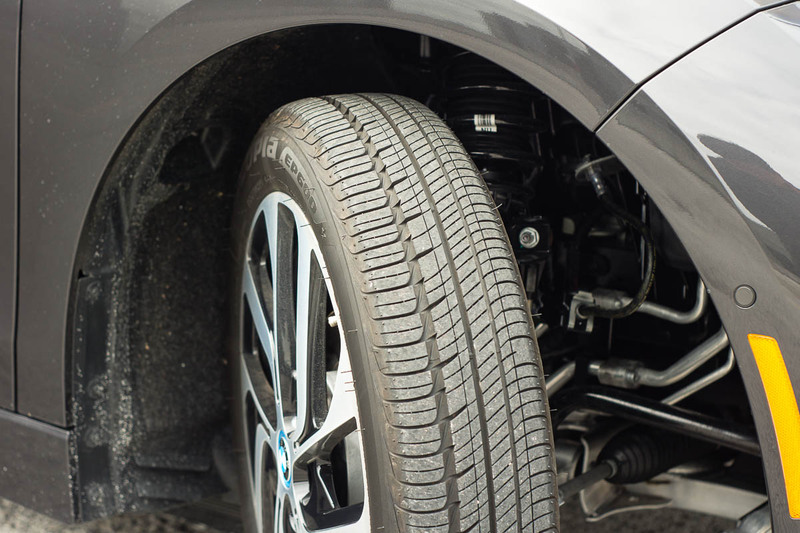 Up front, a 155-section tire is all you get, with a 175-section tire in the rear. 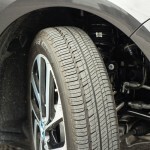 If you thought that was awkward for today’s standards, consider the tire specification up front: 155/70R19! I haven’t seen narrow tires like these in a long time. One big benefit that isn’t apparent right away – the turning circle is astonishingly good, partly due to the narrow tires. 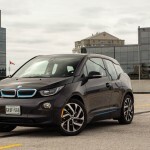 City cars should be maneuverable, and the i3 does a great job in this regard. 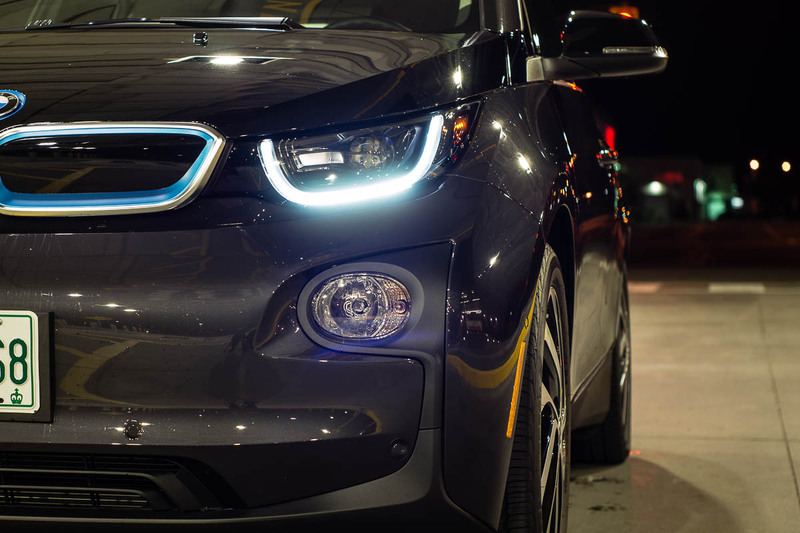 Taking a closer look, you begin to see that the i3 is made up from a lot of exotic materials. The entire passenger cabin structure is made up of bare carbon fibre weave – which is not only incredibly strong, but also comparatively lightweight, even compared to materials like aluminum and magnesium. 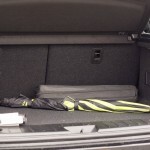 You see it everywhere – in the door jambs, door sills, and around the rear hatch. It’s the kind of stuff typically only found in race cars, and even then, sometimes not to this extent. 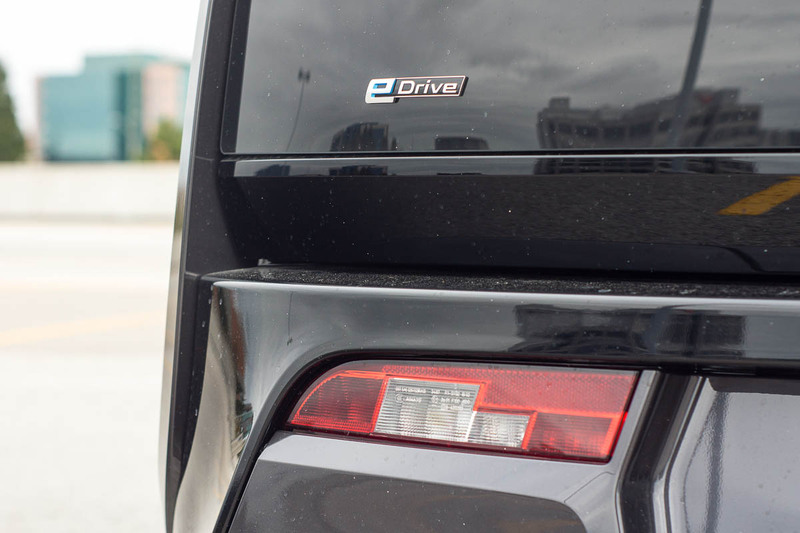 The rear hatch itself is made up of tinted black glass, with un-tinted sections that form the shape of the taillights. 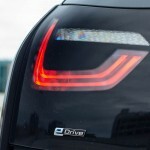 The reverse lights are interesting in that they are shaped like the traditional BMW taillight shape – just smaller. 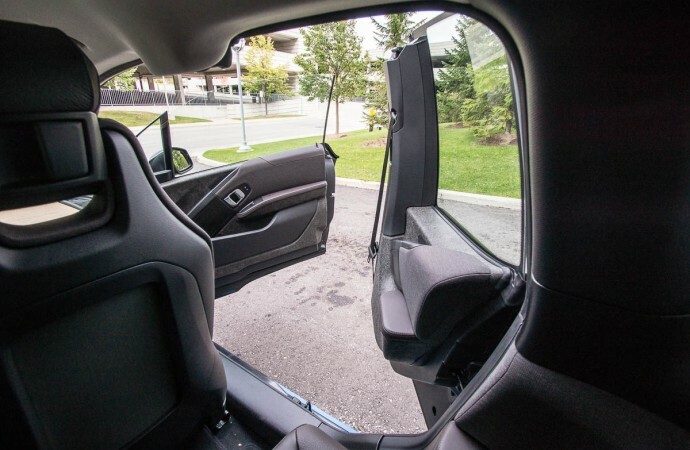 The right side of the i3 houses both the doors for the electric charge port and the gasoline tank – if you have it equipped. 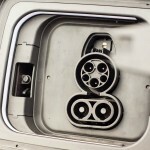 The fuel door is a little unique in that it needs to be electronically unlocked from inside the car, before you can open it from the outside. Regardless, you’ll probably be using the electric charge port more often. The use of exotic and sustainable materials continues inside. 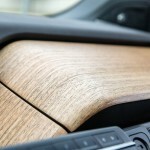 First, the doors and the upper dash panels feature a lot of carbon fibre reinforced plastic. 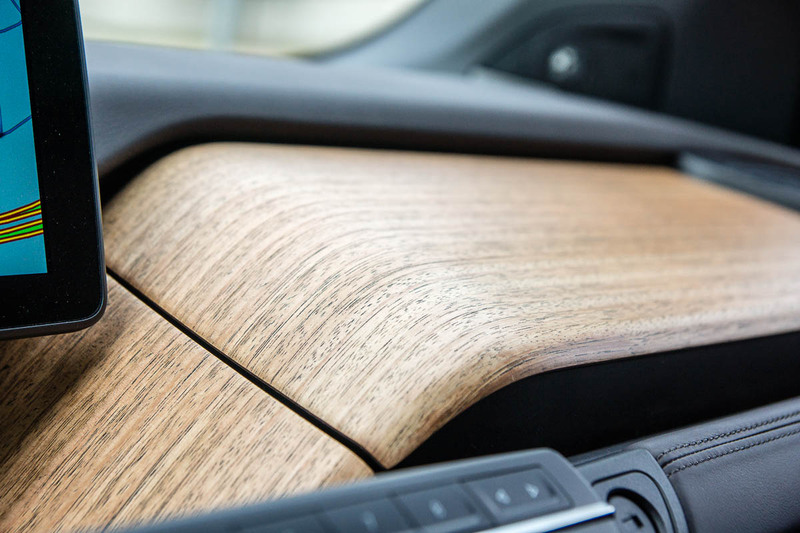 To offset the excessive use of grey materials, sustainable open-pore eucalyptus wood is used, and to be honest, the two-tone feel these two materials impart, almost give you feel you’re sitting in something Scandinavian. It’s a really clean, progressive, and minimalist design scheme. 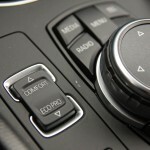 Even the gear selection lever is mounted on the steering column. It’s a little strange at first, but is intuitive in practice. 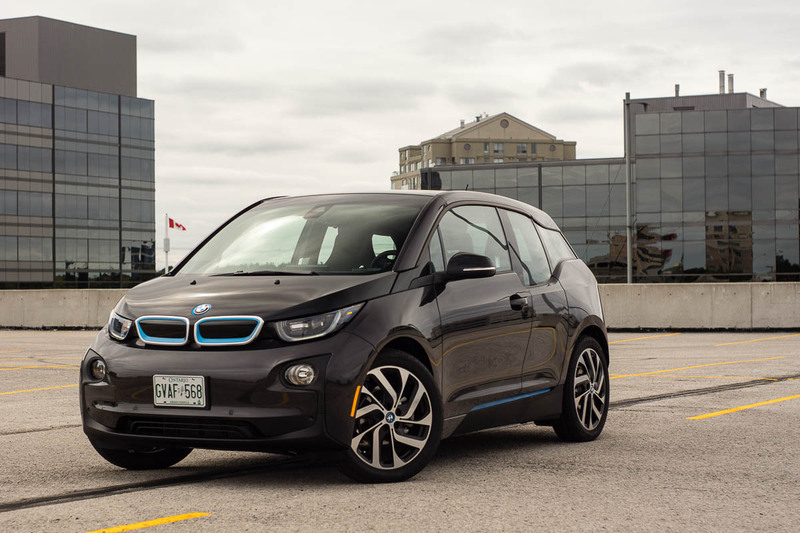 Fun fact: the i3 features a narrow brake pedal, just like in many M performance cars. When you’re looking for maximum sustainability, less really is more. 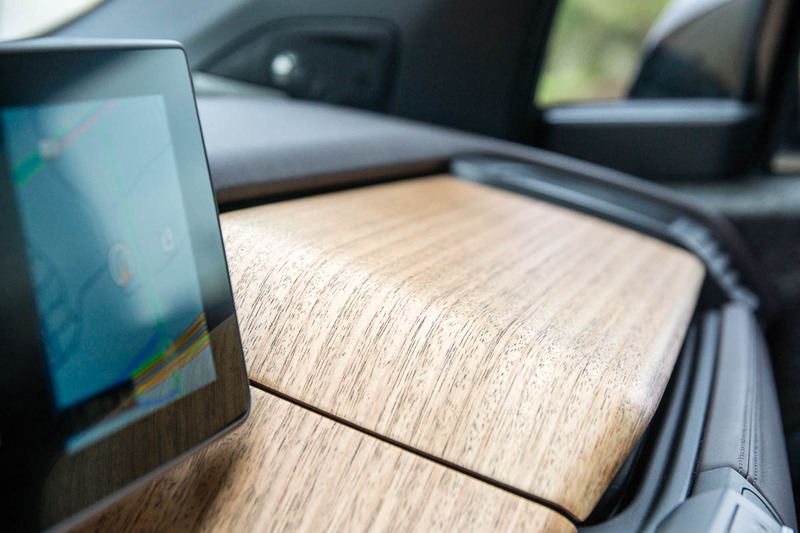 The familiar iDrive screen floats over top of the natural wood – the soft backlighting behind the screen itself is really attractive at night. 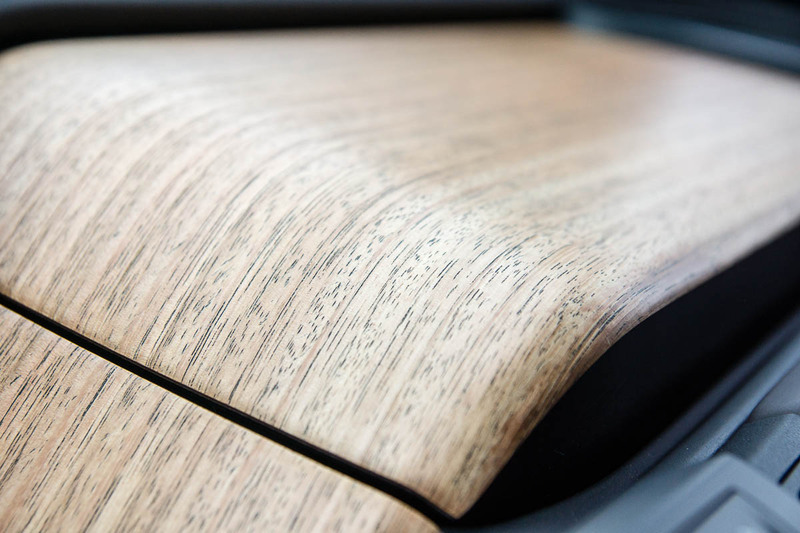 The available leather seats also come from sustainable origins – and the dyes used to give the Dalbergia brown seats their tone comes from olive leaves. 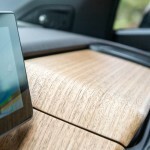 The seats themselves are thinner, in an effort to save weight. 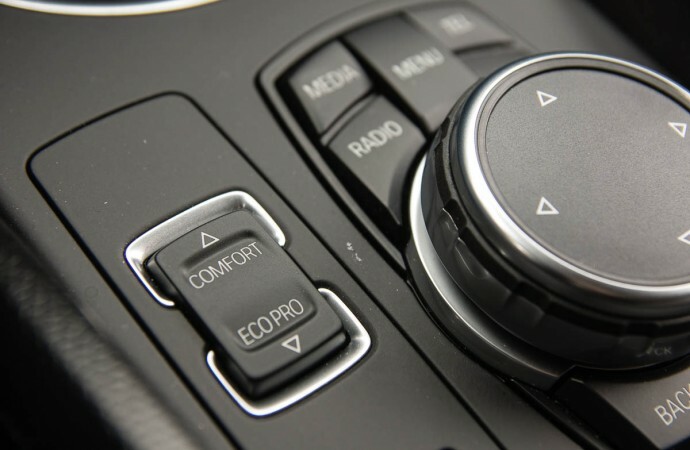 If you don’t opt for the leather seating, the cloth seats are made up of nearly 100% recycled polyester. 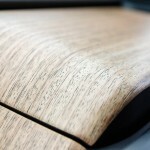 Most of the other materials elsewhere inside are also recycled and/or come from sustainable sources. 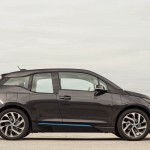 BMW really likes to hammer this point home in their i3 literature. 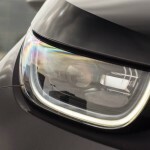 While the i3’s progressive material design choices are unique for today’s standards, what makes it special is its powertrain. 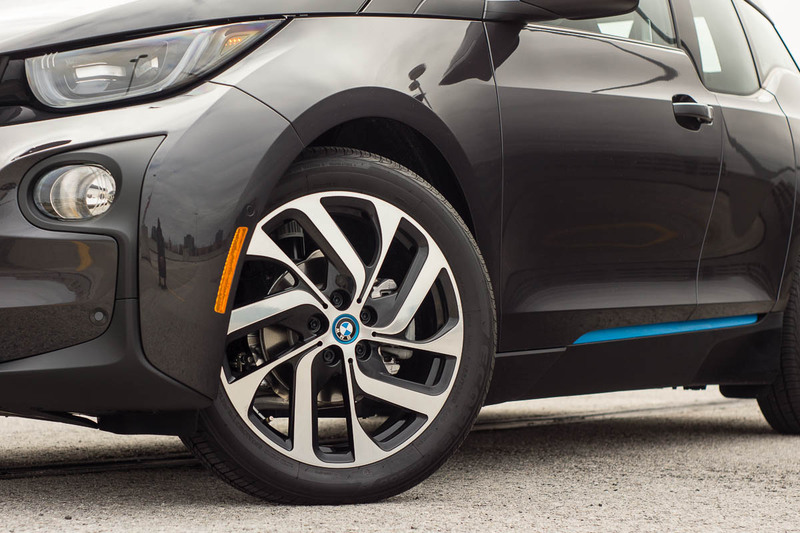 While electric vehicles (and plug-in electric vehicles, by extension) aren’t exactly new anymore, this particular i3 is a little different, in that it has the optional gasoline range extender. 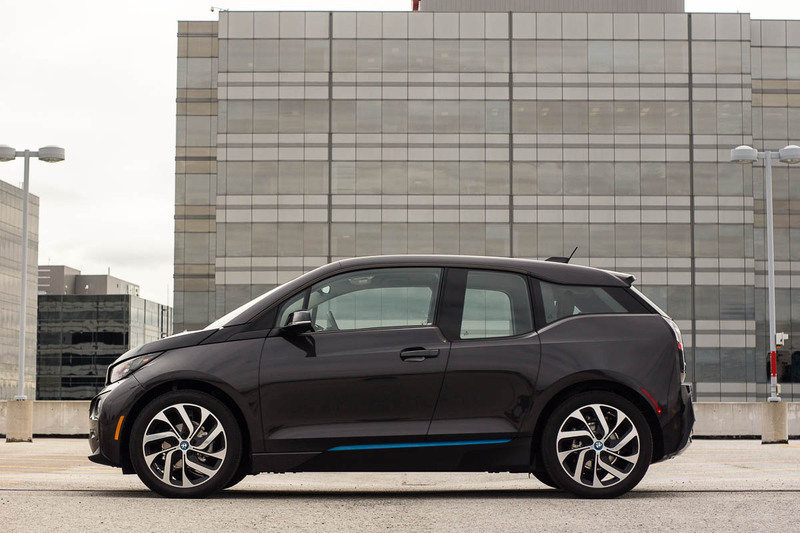 You can choose a pure-electric drive, with the base i3, or get the range extender to add a lot of flexibility to your i3 ownership. The keyword here is flexibility. There isn’t a single BEV or PHEV offered on the market today that allows you to choose whether you need the extra range or not. 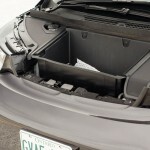 The Chevy Volt, for instance, always carries its 1.4L gasoline engine onboard, whether you need it or not. If you’ve done your research and have decided that the added range is something you need, the gasoline engine you get under the hood is literally a nifty little thing. Displacing only 647cc (that’s 0.647L for those who don’t deal with cubic centimetres very often), and featuring only two cylinders, this inline-two gasoline engine is lifted directly from the BMW C600 and C650GT scooters. This engine is mounted over the rear axle and drives only the rear wheels. 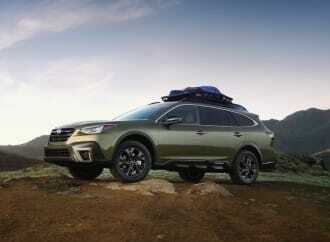 The electric motor puts out a system power of 170 horsepower and 184 lb-ft of torque from 0rpm, through a single-speed reduction gear transmission. Instant power from a standstill and without any noise produced. With the range extender onboard, BMW quotes the 0-100km/h time of 7.9 seconds – hardly slow. 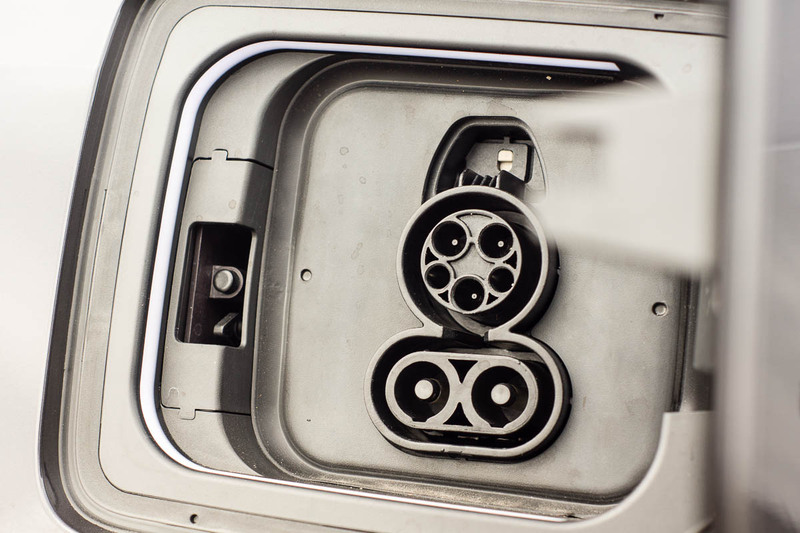 The gasoline range extender acts purely as a generator for the battery and electric motor – it doesn’t contribute any motive power directly to the drive wheels. 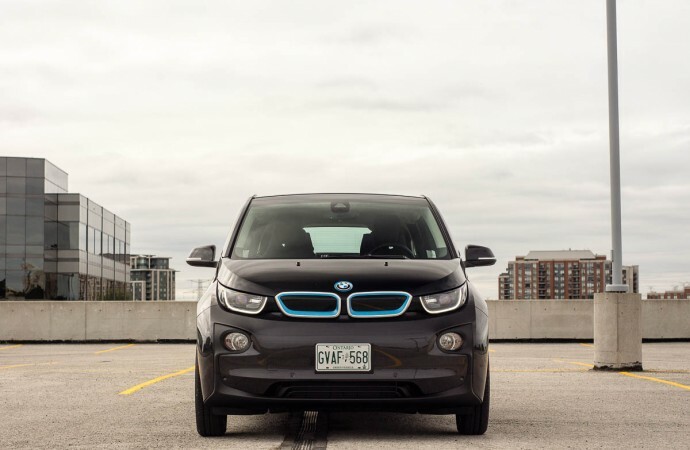 The battery reserve in the i3 is good for about 150km of electric-only operation. 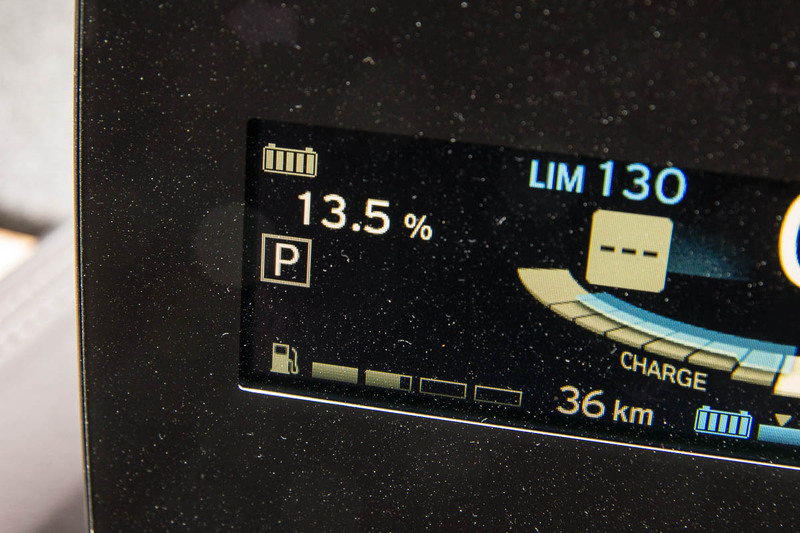 Once you’ve depleted the electric range, the gasoline range extender will kick in at below 10% battery to give you another 120km (approximate). 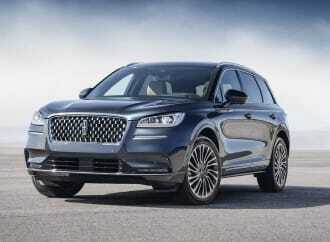 It is only at this point where you will hear the range extender running. Being an inline-two engine, the sound is a little gruff, if not unique. 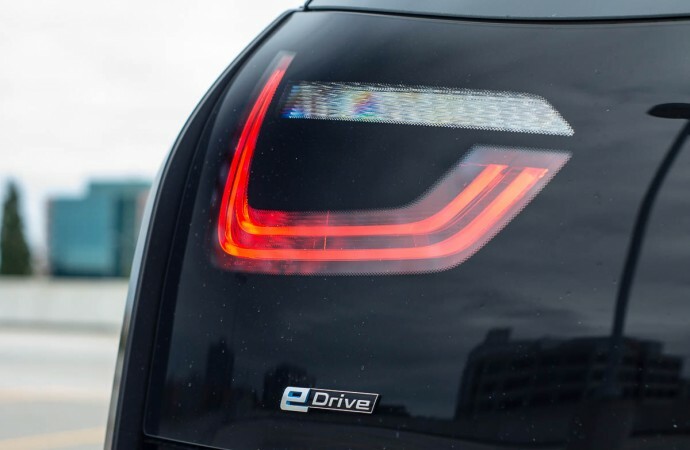 The driving experience is not unlike that of many BEVs, but BMW has configured the overall “eDrive” system to engage aggressive energy regeneration as soon as you take your foot off the accelerator. 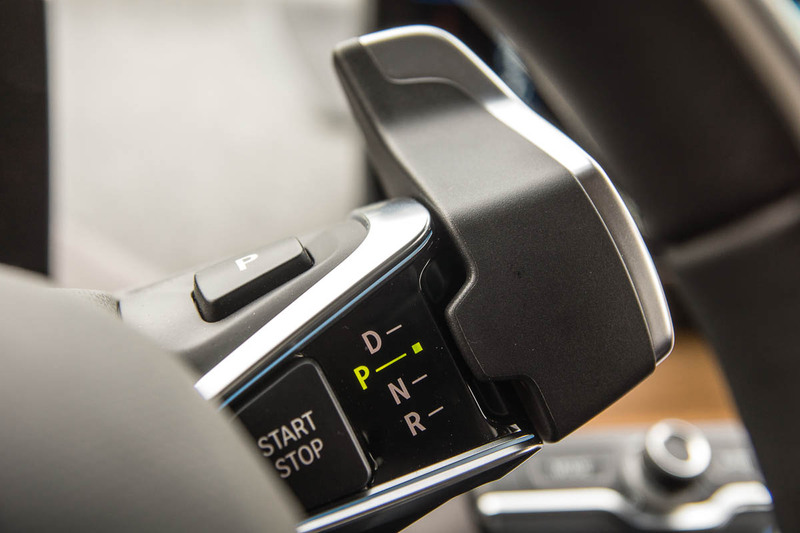 It takes a little getting used to, but once you’ve got the hang of it, you don’t actually have to use the brake pedal very often, maybe just to bring the car from a stop from under 1km/h. I spent the majority of my week timing the stops so that I would stop exactly where I wanted to at a red light, without touching the brake pedal. 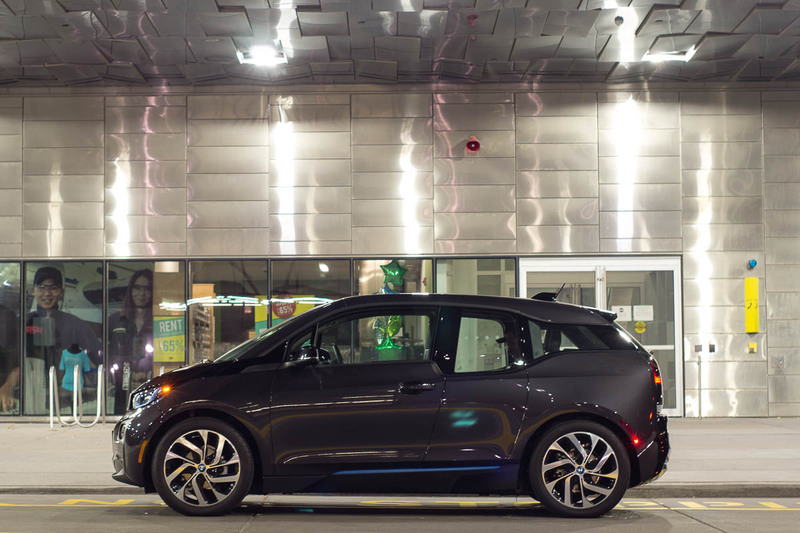 It is this aggressive energy regeneration that makes the i3 a much stronger choice in the city. Sustained stop-and-go traffic didn’t affect the overall electric range much – I even saw the battery percentage climb a little bit with enough regeneration. 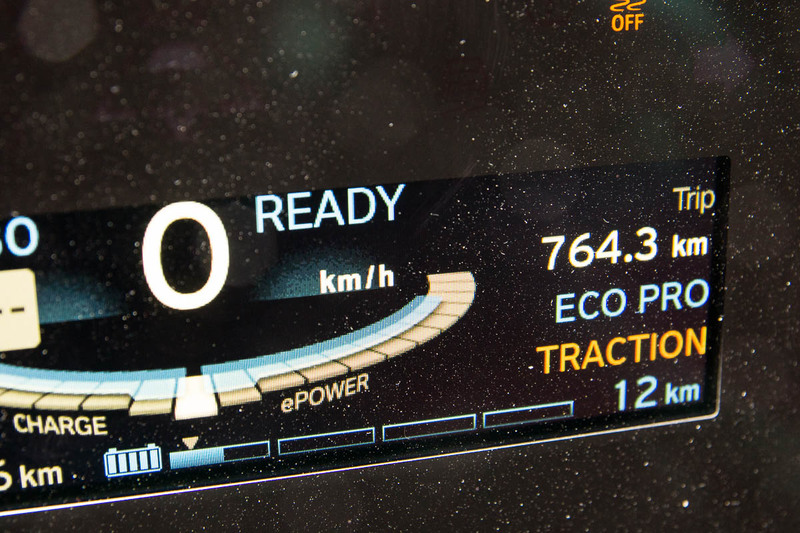 It is the highway (or any sustained high-speed driving, really) that really eats into the electric range. The i3 will happily do highway speeds – up to its top speed of 150km/h. 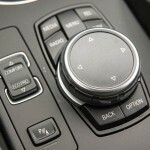 In typical BMW fashion, there are several drive modes to choose from. 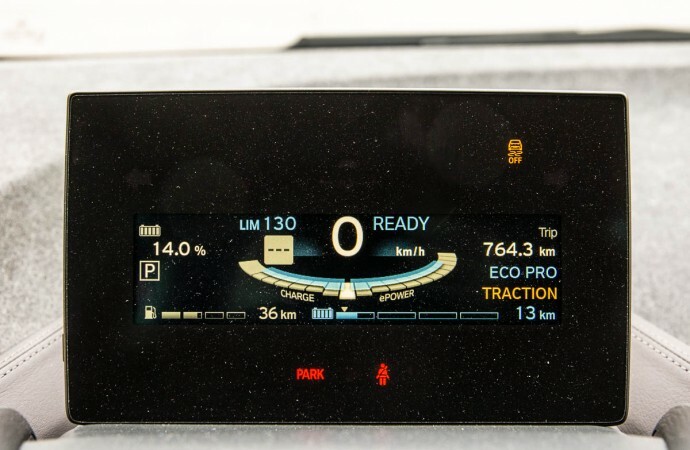 Unlike traditional BMWs, though, there are no “Sport” modes, but rather two “ECO PRO” modes, both varying in how aggressive you want the i3 to be at preserving battery capacity. 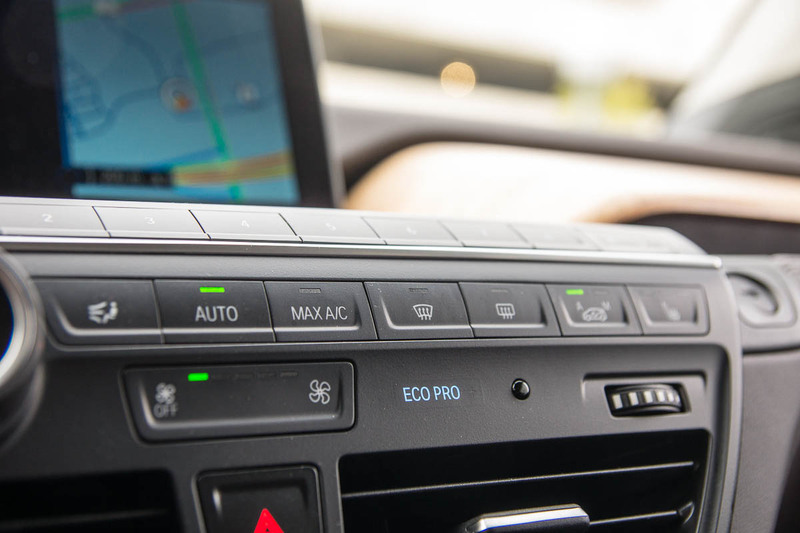 The first ECO PRO mode limits the top speed to 130km/h, reduces accelerator pedal sensitivity, and reduces climate control function to squeeze out another 30km of range (results may vary due to many factors). The ECO PRO+ mode takes it another step further, disabling air conditioning, and limiting the top speed to 90km/h (the i3 will exceed 90km/h if you really step on the accelerator). 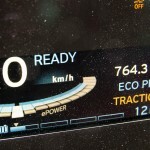 In most cases, the first ECO PRO mode feels like it should be the default setting. The default Comfort mode is a safe bet for those who don’t like to press buttons before setting off, but when you’re looking to maximize your overall electric range, ECO PRO is the mode to be in. The onboard range extender gave me the flexibility and peace of mind I needed to run the usual errands typical for my commute. I didn’t have to worry about having enough battery capacity to make it home in the evening. 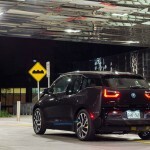 It’s worth mentioning that the battery was only ever at 100% when I picked up the i3 from BMW. Since I don’t have a dedicated high-voltage charge station at home, I was only able to charge the i3 on standard 110V household power. I quickly learned that charging this way was excruciatingly slow. I depleted the battery in a few days, which was to be expected, but charging it overnight at home only increased the battery range by about 25km. 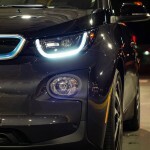 My estimate is that it will take well over 24hrs to completely charge the i3 from a 110V outlet. 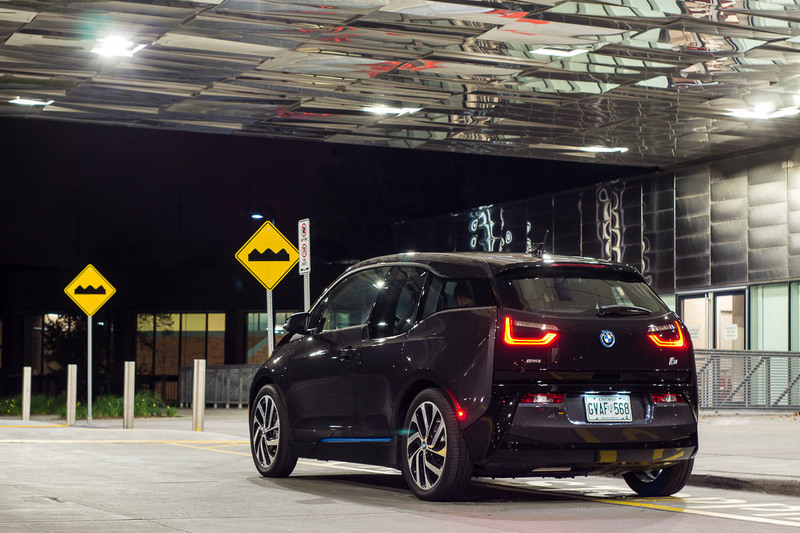 It is generally accepted that i3 buyers will spring for the dedicated hardware to be installed at home, making overnight charging practical. Luckily, the added 120km provided by the range extender really comes in handy. 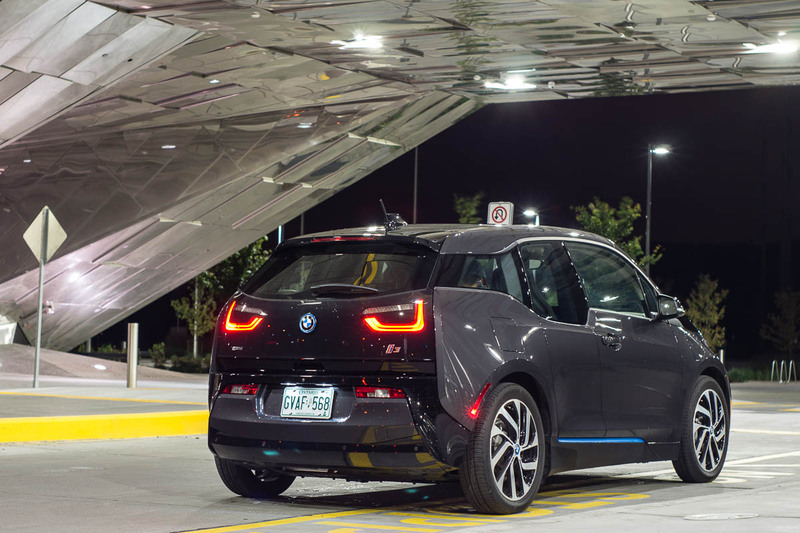 Whenever you’re out of battery power, and out of gas, just fill up the i3 with gasoline like you normally would with a traditionally-powered BMW. 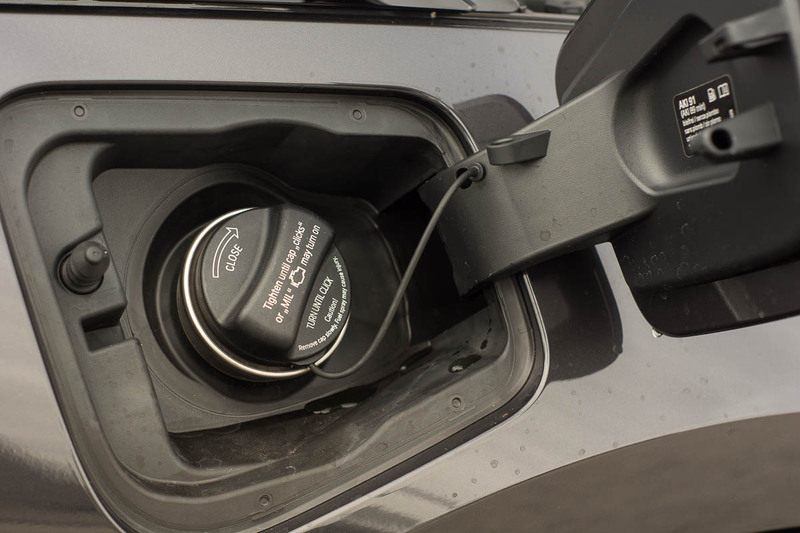 What’s interesting is that the i3 fuel tank will only hold about 7L of 91 octane premium fuel. At the end of my week, I was able to drive over 750km, all while spending about $20 overall. 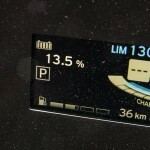 Doing the unscientific calculations for gasoline-only consumption, I ended up with a 2.2L/100km. This doesn’t take into account the cost of electricity. 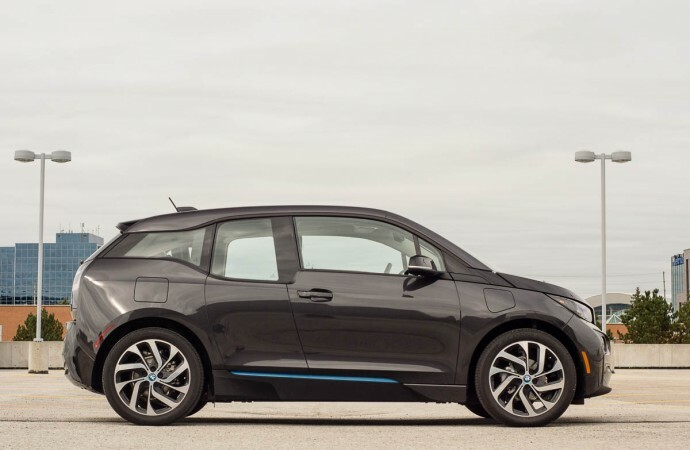 If I was able to get more of a charge into the i3, that gasoline consumption number would be even lower, since the range extender wouldn’t have to run as frequently. 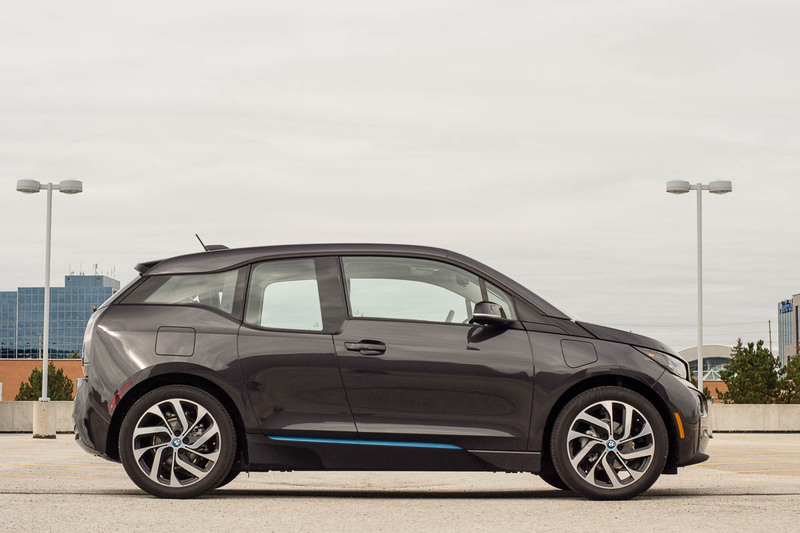 The BMW i3 starts at a base price of $45,300. The range extender adds $4,000 to the up-front cost. My particular tester came equipped with the SUITE “interior world” ($4,250), which denotes the most premium option package. 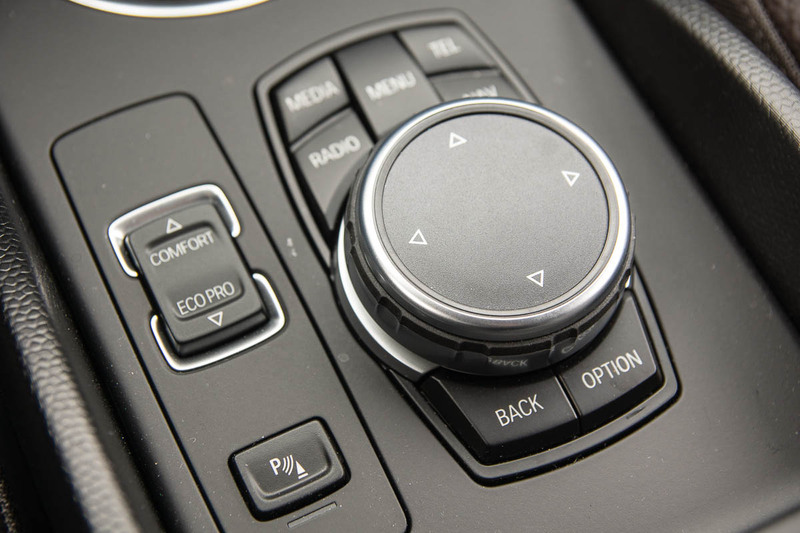 It adds, among other things, keyless comfort access, satellite navigation, and the aforementioned Dalbergia Brown leather. 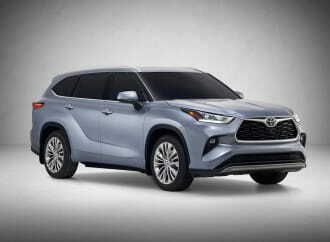 The $2,500 Technology package adds an upgraded Harman/Kardon audio system and Driving Assistant Plus, which encompasses forward collision warning, and adaptive radar cruise control. Lastly, there’s a $750 DC fast charging option that installs a second charge port for much faster charging (0-80% in 30 minutes). This brings the as-tested price to $56,800, before fees and the installation charges to install hardware into your home. 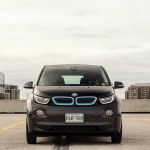 As of this writing now, the Ontario provincial government is offering a rebate of up to $8,500 as part of the EV Incentive Program. 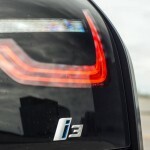 The i3 represents an interesting take on electrified motoring. 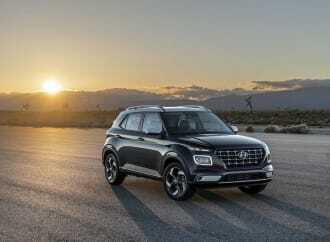 Some choices on the market today don’t give you the option of any sort of range extenders, and some force you to carry around the gasoline engine, whether you really need it or not. 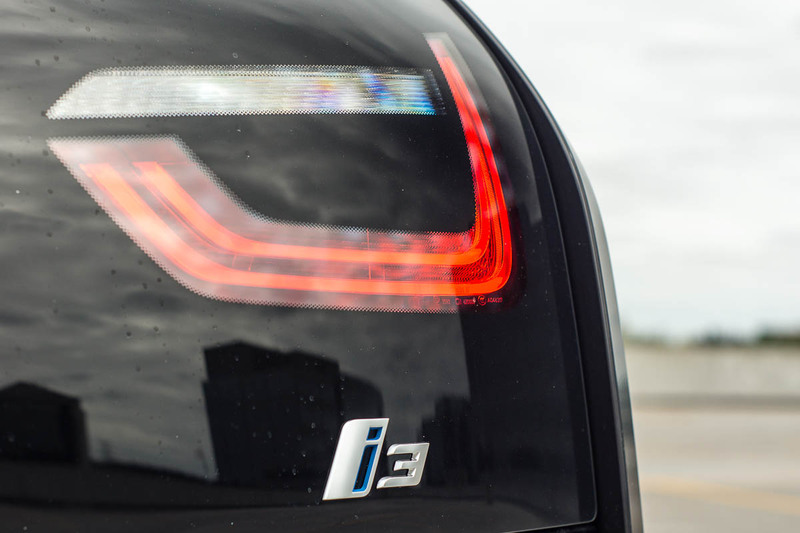 The i3 gives you the choice, and that’s what makes it unique these days. 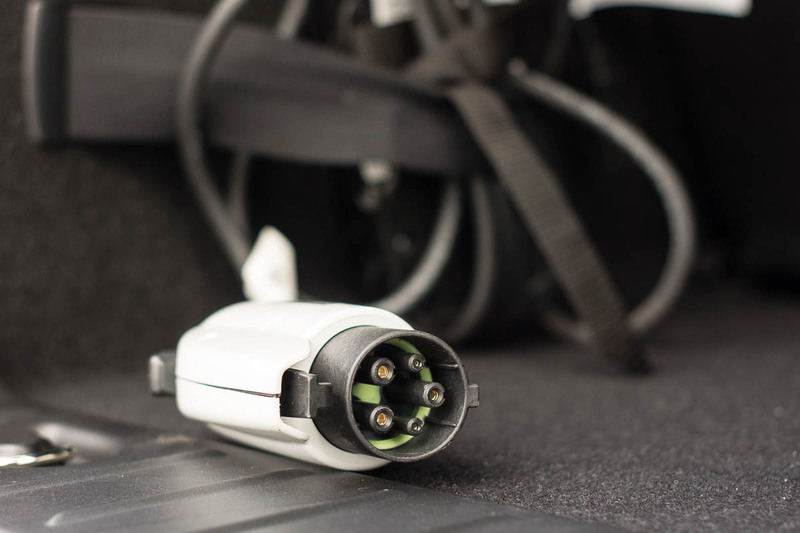 Simply being able to get home may not be something one would have to think about with a traditional gasoline-powered vehicle, but with some pure battery electric vehicles, that’s something that lives in your head constantly. 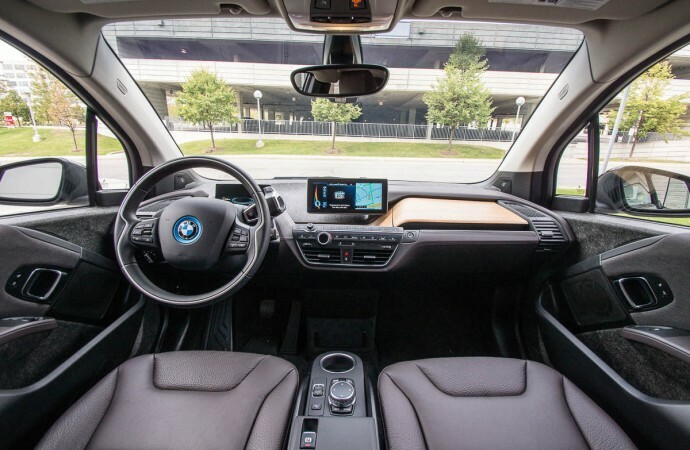 The range extender is the one item that really makes the i3 practical to live with on a day-to-day basis, with peace of mind. It is this peace-of-mind that some would even consider to be priceless. 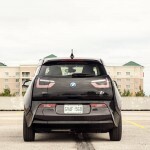 I see the 2016 BMW i3 as a little bit of an engineer’s project, with all the fancy exotic materials throughout and the interesting use of a scooter engine over the rear axle. 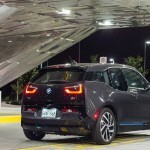 It’s highly likely that BMW will take what they’ve learned here and apply it to more conventional-looking offerings that may already exist in the BMW lineup. 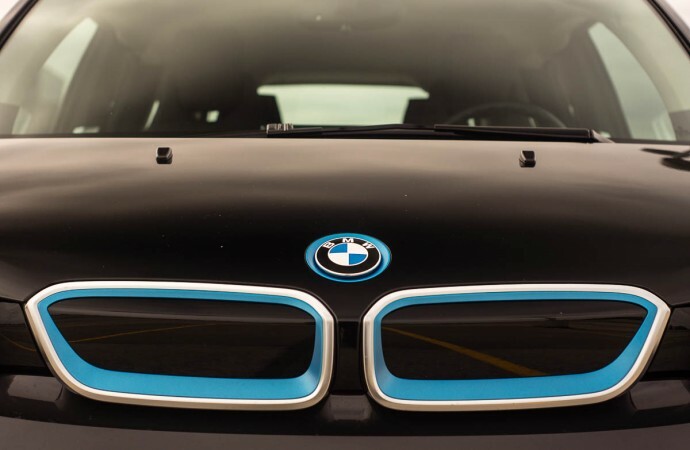 The BMW i8 is proof in that pudding, that it is possible to combine supercar performance, all while respecting the resources needed to go fast in the first place. It’s this progressive thinking that will lead to good things for everybody, down the road, and in the future.